We’ve been busy making some additions to the Cash Log Report, making it easier than ever to keep track of your daily takings, and compare your venues. The first change that you will notice is that you must now pick which venues you wish to run a report for, rather than having to run a report for all venues each time. This means that if you are only interested in looking at a selection of venues, you will find this page loads much faster. 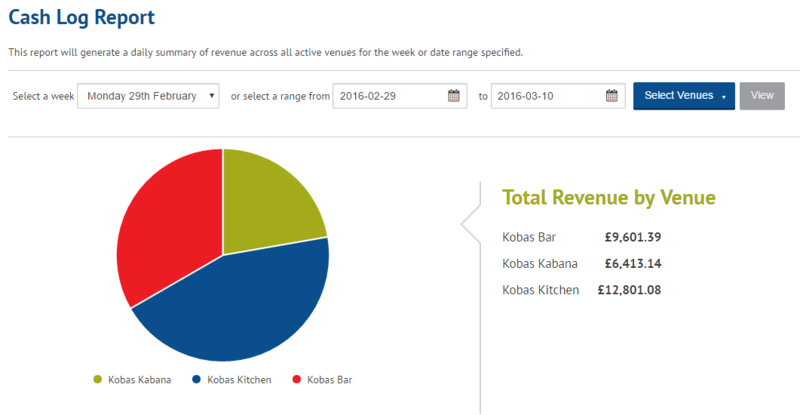 We’ve also added a pie chart, which gives you an instant snapshot comparison of each venue’s total revenue for the chosen period. Other than that, we haven’t changed any of the existing functionality of the page, so you will still be able to view and export your figures as normal, but the process will be faster and more aesthetically pleasing! That covers all the work we have done for now, but we do have some further tweaks planned for this page, so keep an eye out for those soon.